Ira Epstein’s Morning Subscriber Video – Ira Epstein Division of Linn & Associates, LLC. 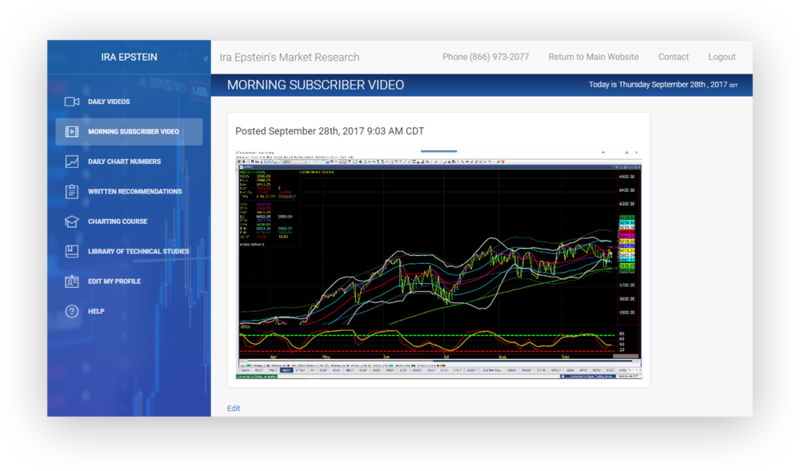 Instant access to our member area where you can easily view Ira’s Free Daily Videos and his Morning Subscriber Video. Available to you on your smartphone, tablet or desktop computer. At approximately 8:30 AM CST, Ira opens his computer's charting software and begins recording a live review of what he sees taking place in the charts. Approximately 40 charts are reviewed in the following sequence, making it easy for subscribers to jump the to categories they want to view, or simply view them all. In these videos Ira offers his ideas on what the chart action looks like, what he thinks "active traders" might be doing along with providing you specific trade ideas. The goal here is to provide you with a current update of chart analysis, recorded at 8:30 AM CST, when all futures markets are open. Typically the video is ready for viewing before 9:00 AM CST. By design, the subscription cost is kept very low. The Video only subscription does not include access to Ira's Written Commentary, Written Trade Trade Recommendations, his Daily Chart Numbers nor Special Intraday Updates as the design of the video is purely about chart action at 8:30 AM CST. You can always upgrade at a later time should you decide to add these other items to your subscription.